The Long Walk seeks proposals for projects involving social-engagement, site specificity, lectures, performance, psychogeography, workshops, video, natural architecture, audio, ritual, and installation. 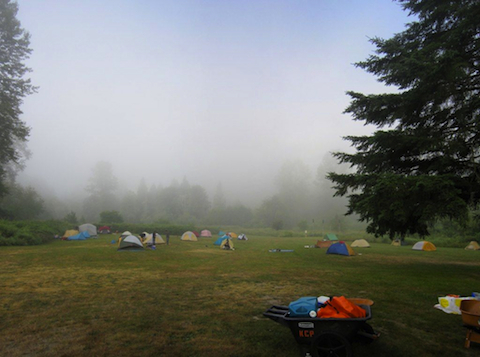 The Long Walk, now in its third year, is a time-based, socially-engaged, and participatory event where artist Susan Robb leads fifty participants on a 4-day, 45-mile journey through Western Washington using the King County Regional Trails System (RTS). Over the course of the four days, the group walks from Puget Sound through cites, suburbs, farmland, and forests, culminating their journey at Snoqualmie Falls. Susan identifies locations for the walkers to camp each night, invites chefs to prepare food with the group, and commissions fellow artists to create work along the route, at the campsites, and with trail-side communities. Email info@thelongwalkseattle.com with either a URL hosting your work or 6 .jpgs of recent work. Please include a CV and a short letter of interest/proposal (400 words or less) detailing a project and the site or sites you are interesting in engaging with from those described below. The beach where The Walkers gather in the early morning on “day 1” before we head off on our journey. The walkers board a 50-passenger paddlewheel ferry in the morning on “day 2” and take an 1.5 hour ride in the morning mist across Lake Washington. This section of the RTS (almost 10 miles long) offers great public exposure. It has extraordinary views of the river, the broad Sammamish River Valley, Cascade foothills and Mt. Rainier. It is extensively used by bicyclists, joggers, skaters, walkers, and commuters. This park features a sandy beach with Snoqualmie river access, tall grasses, cleared play areas and a historic 1920s train depot. It is the location of The Long Walk’s “Mid-Point Mash-Up”, a community event where the walkers get a chance to mingle with the citizens of Duvall. Once one of several large, permanent wintering villages used by the Snoqualmie Indian Tribes, this beautiful park is the site of The Long Walk’s “formal dinner” held under an open-sided barn. The terminus of The Long Walk is this 268 ft. (82 m) waterfall on the Snoqualmie River. The Falls have diverse cultural meanings. For the Salish people, they are a traditional burial site, “the place where First Woman and First Man were created by Moon the Transformer”, and “where prayers were carried up to the Creator by great mists that rise from the powerful flow.” For those interested in pop culture, The Falls appeared prominently in the cult television series Twin Peaks and for the civil engineer, they are the site of are two hydroelectric power plants operated by Puget Sound Energy. The Long Walk is commissioned by 4Culture and the King County Department of Natural Resources and Parks.